Zodiac Flea & Tick Collar for CatsThe new Zodiac Rabon collars kill fleas & ticks, are water resistant, and last for 7 months; 2 months longer than the previous collars. Check out our Large selection of categories for Dogs, Cats,Birds, Reptiles, Fish and NOW Farm pets. Zodiac Breakaway Flea and Tick Collar for Cats. Kills and repels fleas and ticks, is water resistant and provides protection for up to 7 months. This is prohibited by law. USEFUL LINKS. We know you are anxious to receive your stuff. 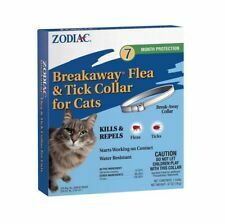 The Zodiac Breakaway Flea & Tick Collar for Cats kills & repels fleas and ticks. They are convenient to use and go wherever your pets do. Molded buckle reduces risk of neck irritation and buckle failure. 3 Pack Zodiac Breakaway Flea and Tick Collar for Cats, 13"
4 out of 5 stars - 3 Pack Zodiac Breakaway Flea and Tick Collar for Cats, 13"
45 product ratings45 product ratings - 3 Pack Zodiac Breakaway Flea and Tick Collar for Cats, 13"
Kills fleas and ticks for up to 7 months. Works even after temporary wetting. Works in as little as 24 hours. Kills fleas which may transmit tapeworms. . Kills and repels fleas and ticks, is water resistant and provides protection for up to 7 months. 4 out of 5 stars - Zodiac Breakaway Flea and Tick Collar for Cats 13"
45 product ratings45 product ratings - Zodiac Breakaway Flea and Tick Collar for Cats 13"